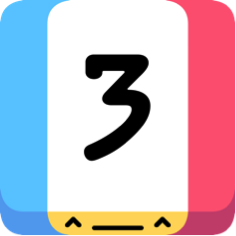 App Review: It's as easy as one, two, THREE! 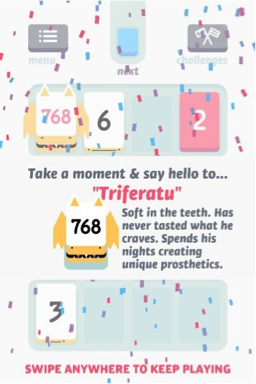 Threes! is one of the winners in the 2014 Apple Design Award, it rose to the 25th spot on the top grosing apps list on the App Store. This slick puzzle game was released on February 6, 2014, the point of the game is simple, players must slide the numbered tile on a grid to combine addends and multiples of three, until there are no moves left on the grid. One of the best features in this app, is the tutorial. 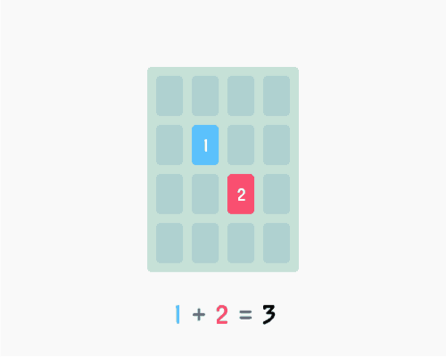 The useful tutorial demonstrates the simplicity of the game, it teaches you which tiles can be combined together: “Blue” (1) and “Red” (2), but the “White” (multiples of 3) can only be combined by the same numbered tile. As soon as I finished the tutorial I was instantly hooked on this wonderful game. Each white tile has a unique face or personality at the bottom, by personality I mean when a “six” tile is side-by-side with another “six” tile, they would greet each other = very adorable. When two white tiles are combined to introduce a new tile, the game will make a special announcment of the tile with a name and small introduction about the tile. Threes! is available on the App Store for $0.99, 33.3333% off for a limited time! For our American readers, the app is currently free at Starbucks as its App Pick of the Week.